Throughout history parents and teachers have mused their children and students with nursery rhymes. We sing them, read them, do fingerplays, act them out and teach with them. Nursery rhymes began in the early 18th century and have evolved in time. Like great poetry, their hidden meanings are arguable, but what is definite is that nursery rhymes are a tried and true method of capturing inspiring young minds and engaging them with literacy. Short and sweet, they help children to learn language formation. They contribute to a child’s spatial development when used with music and movement. Nursery rhymes also contain moral lessons to teach. This is the start of a series on teaching nursery rhymes. I love to teach word families with rhyming words. They are full of rhyming words to use. Often, they have unfamiliar vocabulary words in them too. I found an incredible resource on the State Library of Louisiana which provides a whole list of free (yes, free!) 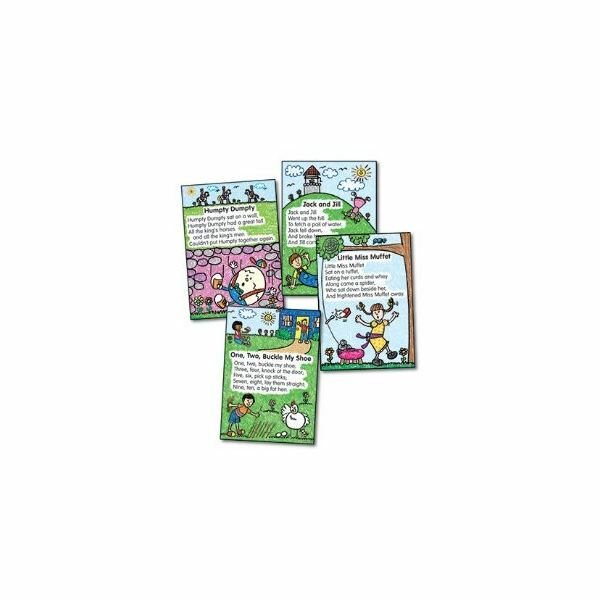 mini books to download of the nursery rhymes. As of right now, all of them in this series are not there, but several are and perhaps there are more nursery rhymes you want to cover. Photocopy and distribute the books for an extra activity in your weekly lesson. For management purposes, have the students write their names on their book. Have the students use popsicle sticks as pointer sticks to read the words along with you or at independent reading time. The fun part about using nursery rhymes in the classroom is that they come in a variety of forms. Either purchased at a teacher store or self-created, they are available in books, coloring books and in a variety of forms on the Internet to download. I believe in giving the student a variety of written text; in this way students will learn that text comes in different shapes, forms and sizes. 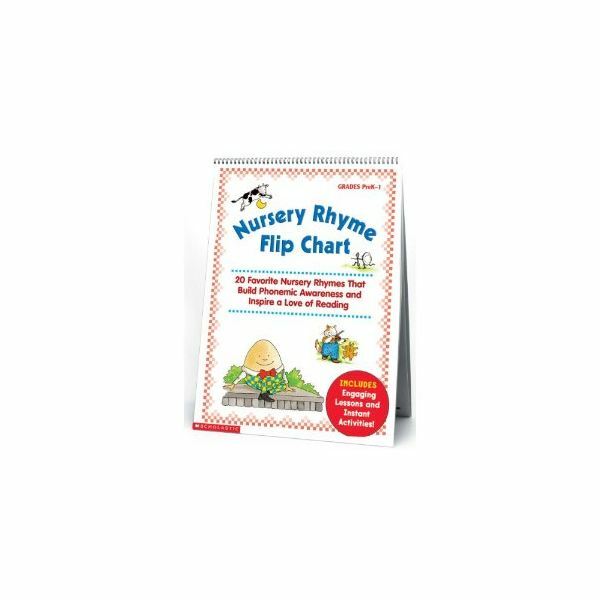 I highly recommend purchasing the Nursery Rhyme Flip Chart by Scholastic, Inc. It's durable and easily wiped down after use with dry erase markers to find those magic words. Leave it available for a center time game while you do this unit and your students will refer to it often. Available on Amazon for under $15.00 currently, it is well worth the price. I also recommend the bulletin board set by Carson Dellosa on nursery rhymes (see photo and reference at the end of this article). They are kid drawn, colorful and have easy to read text. Laminate them for years of use. Students will be able to find the title of the nursery rhyme. Students will be able to track print from right to left with their finger or a pointer stick. Students will be able to orally recite the nursery rhyme. Students will be able to define new vocabulary words. Students will be able to locate word family words within text. Students will be able to state two words that rhyme for each nursery rhyme. Following is a general plan of how to introduce nursery rhymes for the week. As you will read throughout the nursery rhyme series you will see that I modify the format a little for each nursery rhyme lesson plan as pertinent and to keep it from getting mundane for the students. Monday: Start by introducing the intended nursery rhyme for the week. Notice the format, font and title with the class. If you have more than one version or chart of the same rhyme, then introduce it now. Let students form opinions about the text. Compare how they are the same and different; use a Venn diagram to organize responses. Distribute several copies or have copies available for discovery during center time. Discuss the meaning and comprehension of the rhyme. Tuesday: Reread the nursery rhyme. Note any new vocabulary to the class. Chart the definition of each new vocabulary word. Wednesday: Reread the rhyme. Teach rhyming words. Rhyming words, usually, have the same end to them, but a different beginning sound. Point out that they are usually, but not always, found at the end of a sentence. Thursday: Reread the rhyme. Chart the rhyming words. Create a word family with the rhyming words and chart. Friday: Distribute a copy of the nursery rhyme. Students can illustrate it, find the title, and find the new vocabulary they have learned, create their own word family, or write a sentence with the new words they have learned. At the end of the week send the nursery rhyme home in a "poetry" or nursery rhyme notebook to read and review with families. Parents are familiar with the nursery rhymes and have already rehearsed them with their child. It’s a great way to get parents involved. For writing practice, students rewrite the nursery rhyme in their notebook. For homework sheets, there is a great workbook for home practice with dot-to-dots and hidden pictures, also available through Amazon (in reference below). I like this book to add in some thinking skills to the week. Follow this format for each nursery rhyme in the series. As a celebration at the end of the series, students rewrite a nursery rhyme using new words or create an original one, or plan a nursery rhyme character party. Planning a party is a great way to celebrate and the kids dress up as any character they like. Observe small group work and anecdotal records. Oral demonstration of the rhymes. Use the ReadWriteThink interactive site for students to practice word family sorts. Have the students print their word family charts and evaluate for accuracy. Print the rhyming words for each nursery rhyme on index cards and have the students match the rhyming words. School Zone Little Hand Helper Workbooks, Amazon. All lessons in the series developed from Laurie Patsalides’ classroom teaching experience. Carson Dellosa Nursery Rhyme Bulletin Board Set from Amazon. Scholastic Nursery Rhyme Flip Chart at Amazon. Nursery Book Series, Five Mile Press, 2010 (history of nursery rhymes definition).